Are you looking to become a speaker. Maybe you have a unique skill, message or experience that people need to hear about. Or, perhaps you have written a book and are looking to promote it. A list of topics that you are able to speak on. Provide an enticing description of each topic – particularly important for topics that are of a technical nature. Testimonials from previous speeches that you have given. Don’t forget to include endorsements for event planners and sponsoring companies. Include video examples of you speaking. An event planner wants to see a 3-7 minute uncut video clip of you on stage. Ensure that this is the best 5 minutes from your speaking gig! Include professional photos of you speaking. An event planner may want to use these in promotional material. Have a calendar of upcoming events. Also include past speaking gigs so that even planners to get a feel for the breadth of your speaking experience. Include information on any professional associations. This helps to build credibility. If you link to (and from) any profiles you have with those professional associations, it helps with your SEO as well. Have a downloadable speaker one-sheet. You one-sheet should should include professional photographs (include one black and white), at least two bios of different lengths, as well as contact information. Don’t know what a speaker one-sheet is? Click here for Google images. Our team also designs these for speakers so be sure to contact us for our rates and examples. Add a short paragraph on how you love speaking. Include what you love to talk about, your target market, your motivation for speaking, your passion should really shine through here! This is not a static list! As you book events make sure you find a way to record each event. Then pick the best 10 minutes and feature the clip on your website. Update the speaking gigs profiled on your website routinely. And don’t forget your calendar! Don’t beat yourself up if you don’t have all of these pieces in order. It’s meant to evolve over time – just like your speaking itself! 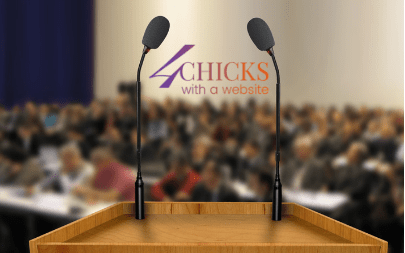 Do you already have a speaker page? Or additional ideas? Have an awesome speaking page you want to share? Do tell … post your comment below and let’s share the love!